Myriapods have a single pair of antennae and, in most cases, simple eyes. The mouthparts lie on the underside of the head. There is an "epistome" and labrum forming the upper lip, and a pair of maxillae forming the lower lip. A pair of mandibles lie inside the mouth. Myriapods breathe through spiracles that connect to a tracheal system similar to that of insects. 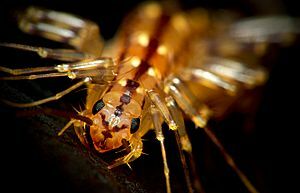 Centipedes make up the order Chilopoda. They are fast, predatory and venomous, hunting mostly at night. There are around 3,300 species, ranging from the diminutive Nannarup hoffmani (less than half an inch in length, c. 12 mm) to the giant Scolopendra gigantea, which may exceed 30 centimetres (12 in). Arthropleuridea were ancient myriapods that are now extinct. 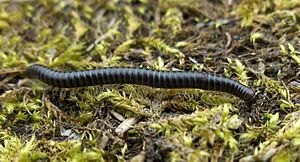 The most famous members are from the genus Arthropleura, which was a giant, probably herbivorous, animal that could be up to 3 metres (9.8 ft) long. Arthropleuridea may be a division of the millipedes. Some of the various hypotheses of myriapod phylogeny. 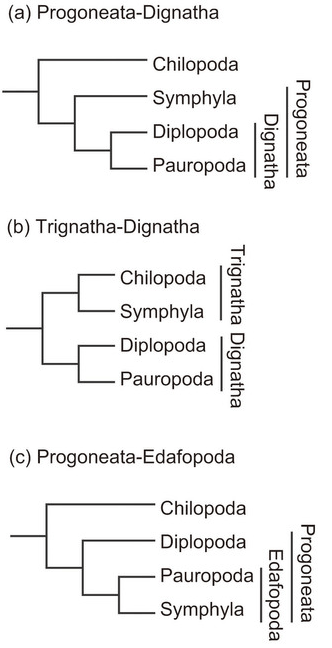 Morphological studies (trees a and b) support a sister grouping of Diplopoda and Pauropoda, while studies of DNA or amino acid similarities suggest a variety of different relationships, including the relationship of Pauropoda and Symphyla in tree c.
Myriapoda Facts for Kids. Kiddle Encyclopedia.